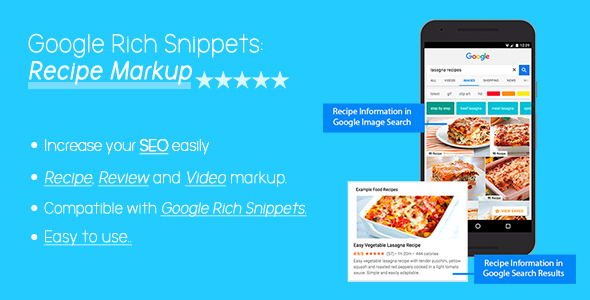 Rich snippets were designed to give users more information about search results. Google has always been about the customer experience, so rich snippets provide more information to the customer and either answer their query or give them more insight into a search result before they click it. Mark up your recipe content with structured data to provide rich results and host-specific lists for your recipes, such as reviewer ratings, cooking and preparation times, and nutrition information. This content can be eligible to be displayed as a rich result in Search results and guidance with the Google Assistant on Google Home. Whether structured data affects rankings has been the subject of much discussion and many experiments. As of yet, there is no conclusive evidence that this markup improves rankings. But there are some indications that search results with more extensive rich snippets (like those created using Schema) will have a better click-through rate. According to John Mueller, structured data helps a web page rank better in the same way regular content helps a page rank. The heart of search engine optimization is making it easy for a search engine to understand what the web page is about. Structured data is a fantastic way to communicate what products are for sale, where a business selling the product is located, what the hours of operation are, how many people reviewed a product and so on. Structured data makes it easy to communicate important information about a product, a business and a web page. This plugin works with all the themes and plugins. You just need to activate the plugin and that it. This plugin is quite fast and will not strain your site. All these settings can be done with one click!